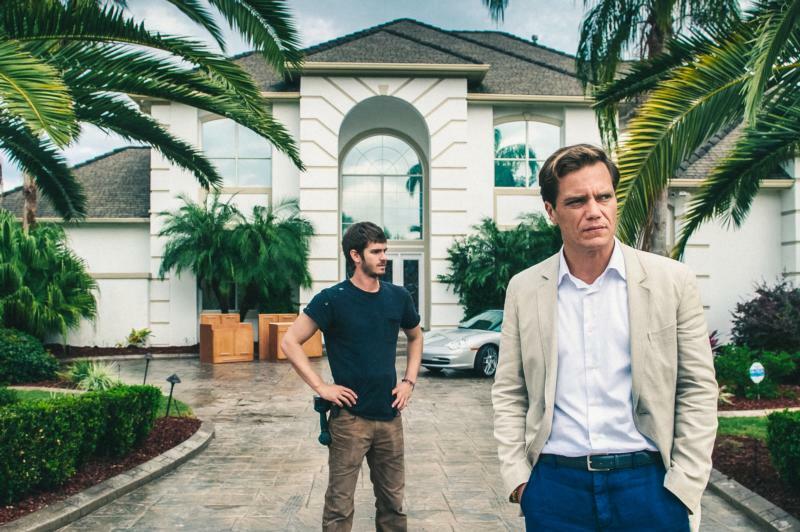 NEW YORK (CNS) — Trenchant, didactic and unflinching, “99 Homes” (Broad Green) also is an example of profoundly moral filmmaking. Director Ramin Bahrani, who co-scripted with Amir Naderi, portrays the Faustian bargain struck between two bit players on the Orlando, Florida, real estate scene as each tries to weather the maelstrom of forces unleashed by the financial crisis that began in 2008. Bahrani’s scenes of families being forced from their homes — staged with real police officers and residents of New Orleans (where the film was shot) — have a painful documentary reality. He manages to make knocks on the front door sound as terrifying as hostile gunfire. The story opens with unemployed construction worker Dennis Nash (Andrew Garfield), his mother, Lynn (Laura Dern), and young son, Connor (Noah Lomax), being evicted by pitiless broker Rick Carver (Michael Shannon). It’s a humiliating ritual in which the residents, unable to make mortgage payments, are given just a couple of minutes to gather their most essential possessions — after which all their furniture is deposited on the curb. Many have lawyers, and have gone to court to prevent precisely this outcome. But the legal system is overburdened, the judges lack compassion and the system as a whole is rigged by corrupt political machinations. To make this explicit, Carver gloats about receiving money from Fannie Mae — as the Federal National Mortgage Association is informally known — to resell foreclosed properties. Sometimes forged documents also are involved. After moving Lynn and Connor into a motel, Nash is forced to do some quick thinking. So when a confrontation over stolen tools leads to an offer to work for Carver, Nash grabs at it — even if his first task turns out to be shoveling backed-up sewage out of a foreclosed house. Carver, we learn, needs a new assistant for his soul-corroding work because his last one committed suicide. Nash is soon directing the eviction crew because it turns out that Carver — who is not as one-dimensional as we were initially led to believe — loathes these confrontations, which often require him to carry a handgun. After that, however, Bahrani frequently gives Carver pithy speeches to illustrate that Carver knows that what he’s doing, although legal, is less than ethical. Nash, who wants to make enough money to get his own dwelling back, works without compunction. In his greed, he even chisels his crew out of their wages. The truth of his downward spiral slowly dawns on Nash as the stakes increase with a multimillion-dollar deal for a bulk buy of distressed properties. Lynn serves as his moral compass. She’s wary of returning to the house they were evicted from, and reacts in horror when she realizes the means Nash used to purchase a luxurious new replacement for it. By making both Carver and Nash profoundly human — with all the flaws that condition entails — Bahrani forces his audience to realize the degrading agony that has resulted from the real estate meltdown. The film contains a scene of suicide and frequent rough and crude language. The Catholic News Service classification is A-III — adults. The Motion Picture Association of America rating is R — restricted. Under 17 requires accompanying parent or adult guardian.